PULLMAN, Wash. – Ice-free pavement. “Smart snowplows.” Vegetable juice ice-melt. Cold-climate researchers at Washington State University are clearing the road with green alternatives to the salt, sand and chemicals typically used for highway snow and ice control. 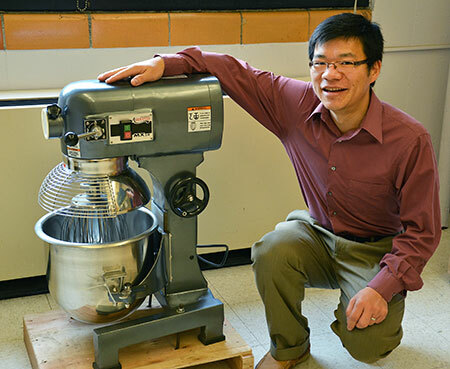 As a nation, “we are kind of salt addicted, like with petroleum, as it’s been so cheap and convenient for the last 50 years,” said Xianming Shi, WSU associate professor in civil and environmental engineering. But this winter, road salt is in short supply across the northern states. In some regions prices have increased 10-30 percent since last year, said Shi. Also, there are public concerns about salt’s impact on the environment and how this might affect future generations. Shi is assistant director of the recently established Center for Environmentally Sustainable Transportation in Cold Climates. It is the only center in the U.S. studying cold climate “road ecology,” which includes green snow and ice control plus issues with wildlife crossings, fish passages, dust and the use of recycled materials in pavement. Funded by the U.S. Department of Transportation at $2.8 million for two years, the center is a collaborative effort between the University of Alaska Fairbanks, Montana State University and WSU. Liv Haselbach is the WSU site director. The U.S. spends $2.3 billion each year to remove highway snow and ice plus another $5 billion to mitigate the hidden costs associated with the process. That’s not counting the costs for city and rural road maintenance, said Shi. Though snow and ice control can appear quite simple – just plow the road and put on some salt or sand – Shi said getting it right is highly technical and involves detailed science and engineering. “Ordinary snowplows have at least one sensor to measure pavement temperature,” he said. “Smart snowplows not only read temperature but also residual salt from previous applications, the presence of ice and the amount of friction on the road. All of these readings help operators apply less salt. “It can tell you current road and weather conditions, give weather forecasts, inventory salt supplies and suggest application rates based on those variables. It also allows you to model alternative types of salts to see what will happen,” he said. At WSU, Shi’s passion is cooking up green deicers and ice-free pavement. In his laboratory, a brand-new, industrial size mixer awaits his “culinary” genius. He is also mixing up several new types of concrete that can streamline snow and ice removal while protecting the infrastructure. Deicer-resistant concrete, for one, doesn’t break down as quickly in the presence of salt and chemicals, thereby extending the life of roads and sidewalks, he said. “Our ultimate goal is to apply the best amount of salt, sand or deicers at the right location at the right time,” he said.